Power Your Mind naturally with Hypnosis to stop the destructive habit of binge drinking - for good! 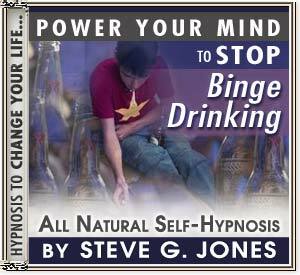 Stop Binge Drinking with this powerful hypnosis Program !!!!! Whether or not you want to admit it, binge drinking is a form of alcoholism that is as dangerous to your physical and mental health and your relationships as drinking too much on a daily basis. If you can’t seem to break the cycle of binge drinking then hypnosis can help. Binge drinking is defined as drinking an excessive amount of alcohol in a short amount of time. It may be that you only drink this way on the weekends and then function at top capacity during the work week without any alcohol at all. Even this cyclical pattern of drinking can be damaging and can be stopped with a new mindset – one that can be achieved through hypnosis. Hypnosis could save a life in the case of a binge drinker. The statistics indicate that binge drinking can cause a person to lose consciousness and even die due to alcohol poisoning. It is a scenario seen far too often on college campuses. People who drink often and in large amounts also cause serious damage to their liver. This is because 90% of the alcohol consumed passes through the liver. Liver disease, known as cirrhosis, is a condition found in many binger drinkers. In order to change the habitual part, and even the physical addiction to drinking, hypnosis reaches into the part of the mind where the need to do something habitually is stored. You are put into a relaxed state through soothing dialog. Once relaxed, a spoken message reinforces the changes you want to make. This is done for 21 consecutive nights to cement the behavioral changes. Dr. Steve G. Jones M.Ed. is a clinical hypnotherapist who has developed a self-hypnosis program specifically targeted toward binge drinkers. "Stop Binge Drinking" is available in an MP3 download or in CD format.